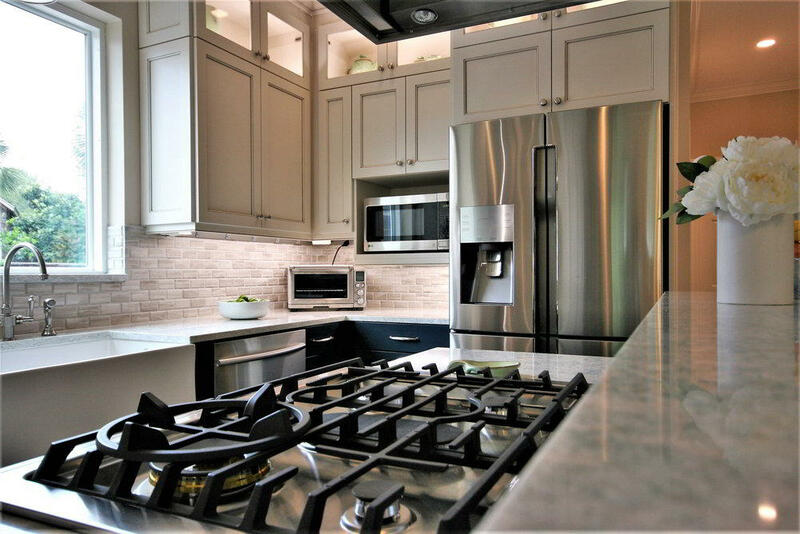 This unique kitchen designed by Scott Haig, CKD of Bay Area Kitchens, features white Brookhaven cabinets by Wood-Mode as a backdrop to rich deep blue accent cabinets and accent tiles. 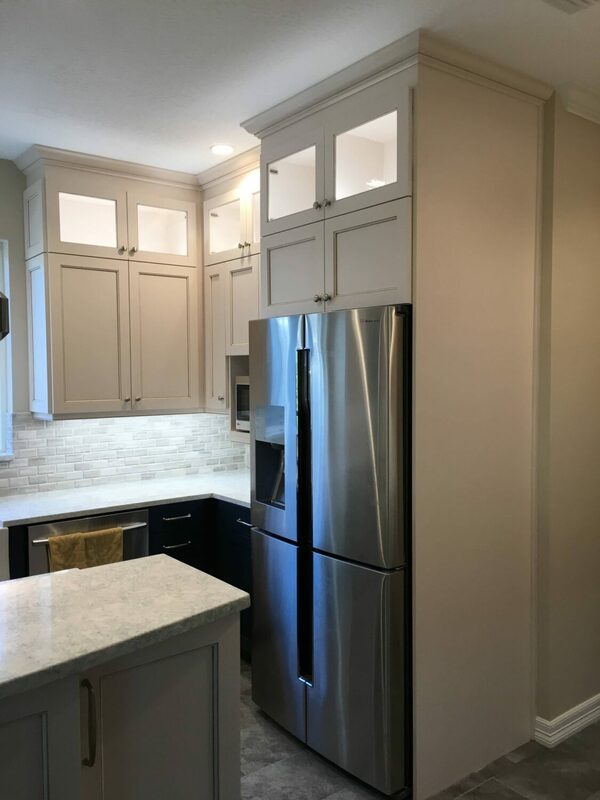 While the Cambria Montgomery countertops appear to be white at first glance, a closer look will reveal a soft combination of blues and grays that pull the whole room together. While this Houston, TX kitchen makeover looks gorgeous, it is also packed with functional features and storage, including drawers in most lower cabinets, turn-out shelves to utilize an otherwise dead corner, all adjustable shelves elsewhere, LED lighting inside and below the upper cabinets, a double-oven range, farmhouse sink, and a custom recirculating hood by Vent-A-Hood. 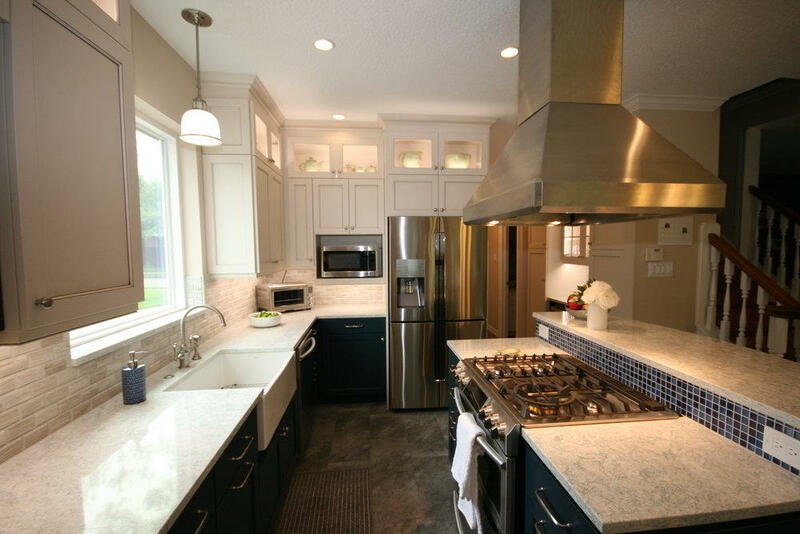 Kitchen Remodeling Contractors in Houston TX This unique kitchen designed by Scott Haig, CKD of Bay Area Kitchens, features white Brookhaven cabinets by Wood-Mode as a backdrop to rich deep blue accent cabinets and accent tiles. 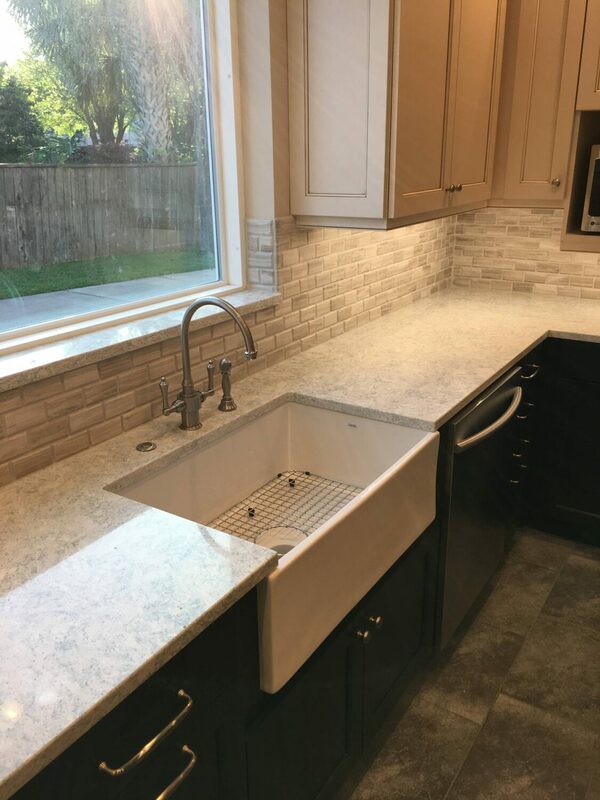 While the Cambria Montgomery countertops appear to be white at first glance, a closer look will reveal a soft combination of blues and grays that pull the whole room together. 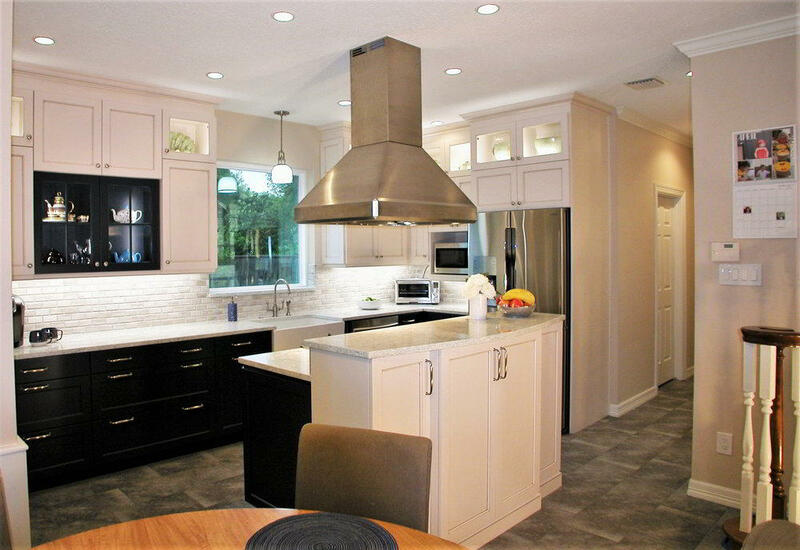 While this kitchen looks gorgeous, it is also packed with functional features and storage, including drawers in most lower cabinets, turn-out shelves to utilize an otherwise dead corner, all adjustable shelves elsewhere, LED lighting inside and below the upper cabinets, a double-oven range, farmhouse sink, and a custom recirculating hood by Vent-A-Hood. 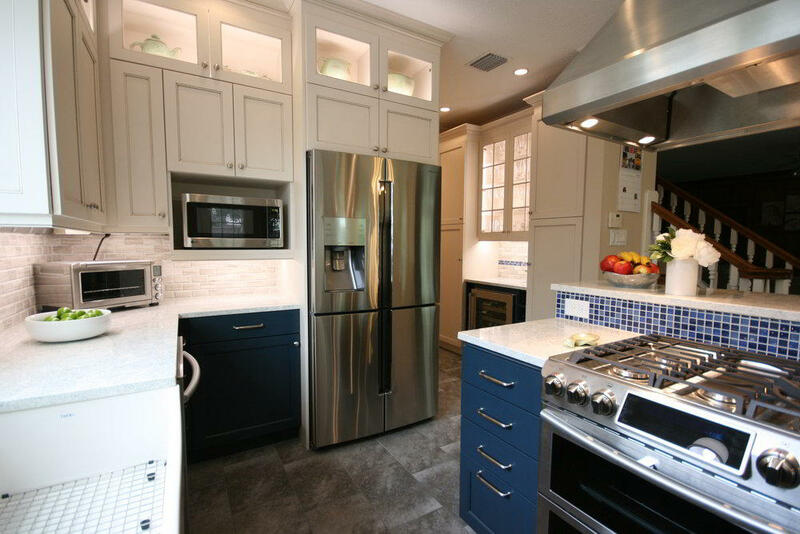 This unique kitchen designed by Scott Haig, CKD of Bay Area Kitchens, features white Brookhaven cabinets by Wood-Mode as a backdrop to rich deep blue accent cabinets and accent tiles. 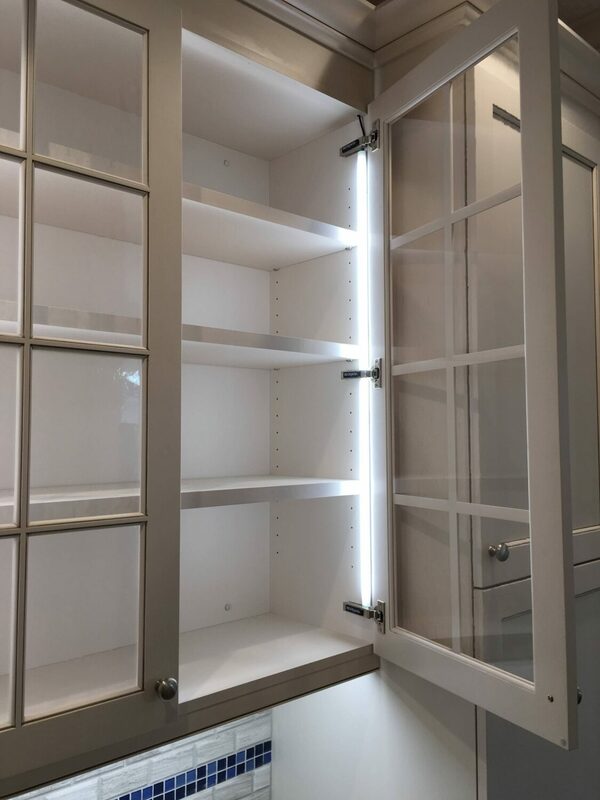 The upper glass-door cabinets are illuminated with LED lighting. 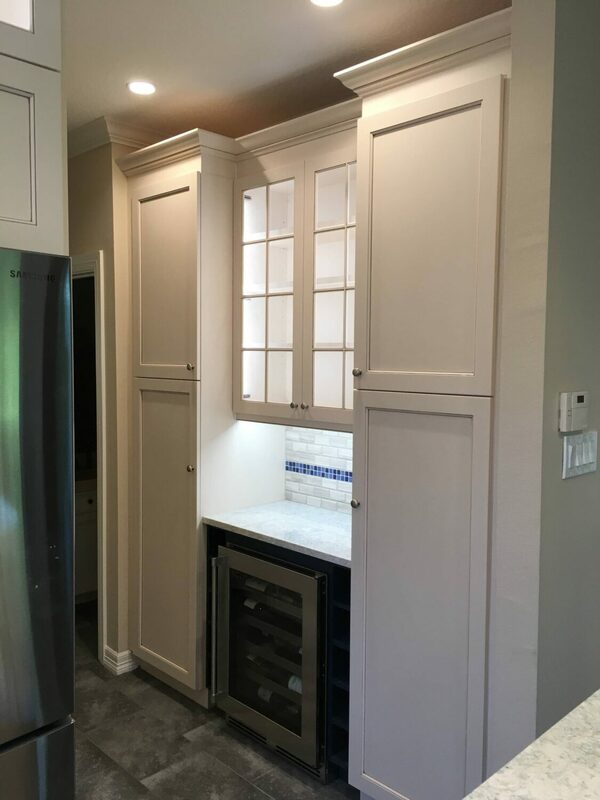 This unique kitchen designed by Scott Haig, CKD of Bay Area Kitchens, features white Brookhaven cabinets by Wood-Mode as a backdrop to this rich deep blue accent cabinet. 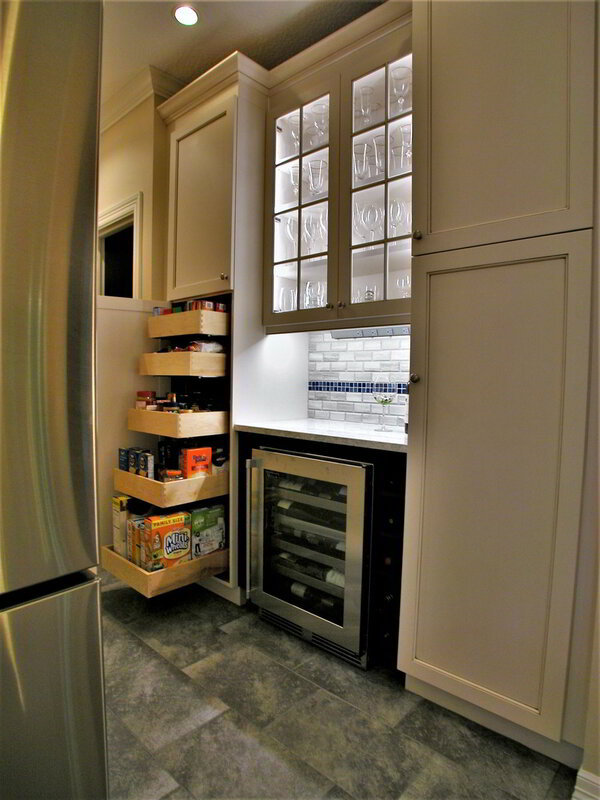 LED lighting inside the glass-door cabinets will highlight the client's dishes and treasures. This unique kitchen designed by Scott Haig, CKD of Bay Area Kitchens, features a farmhouse sink set in the Cambria Montgomery countertop. The pantry / bar area of this unique kitchen designed by Scott Haig, CKD of Bay Area Kitchens, features white Brookhaven cabinets by Wood-Mode as a backdrop to rich deep blue accent cabinets and accent tiles. 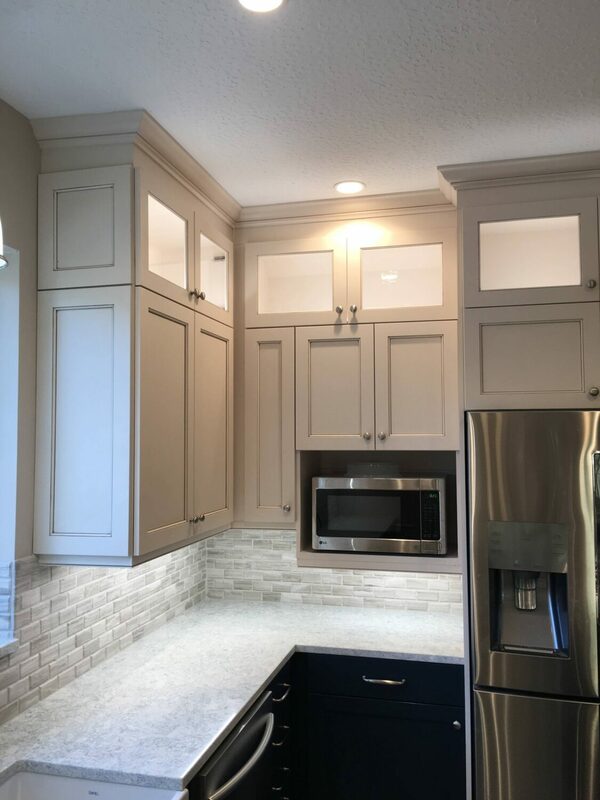 While the Cambria Montgomery countertops appear to be white at first glance, a closer look will reveal a soft combination of blues and grays that pull the whole room together. 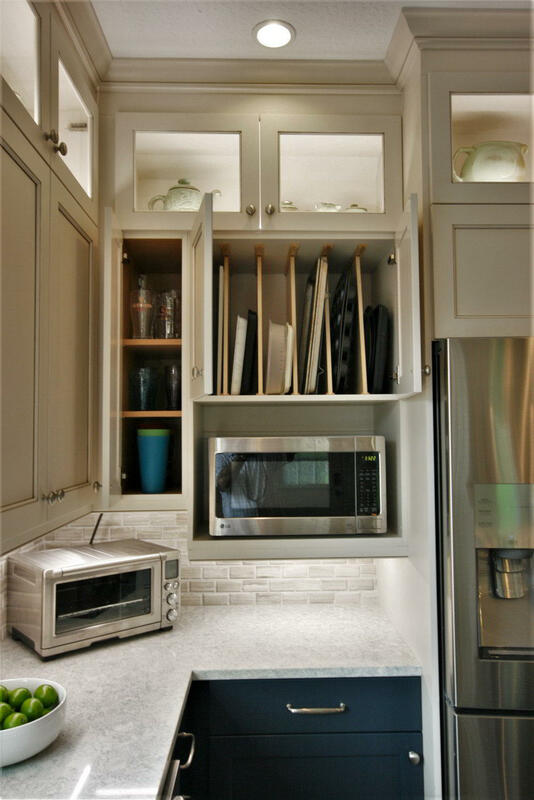 LED lighting inside and below the upper cabinets keeps the room bright and light. 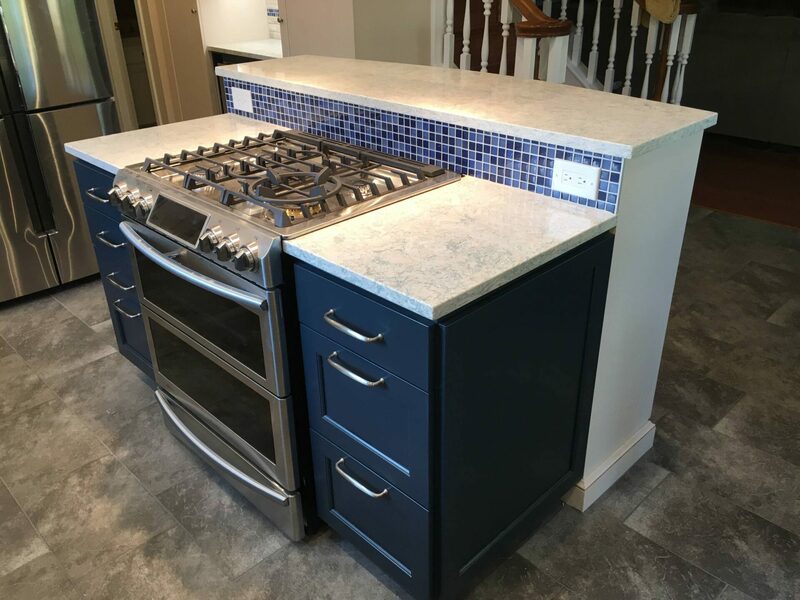 This unique island designed by Scott Haig, CKD of Bay Area Kitchens, features rich deep blue accent cabinets and accent tiles. 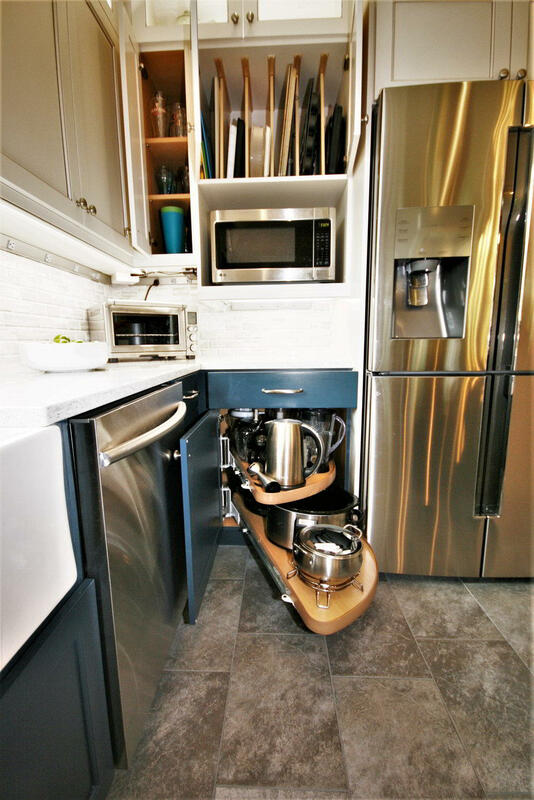 While the Cambria Montgomery countertops appear to be white at first glance, a closer look will reveal a soft combination of blues and grays that pull the whole room together. 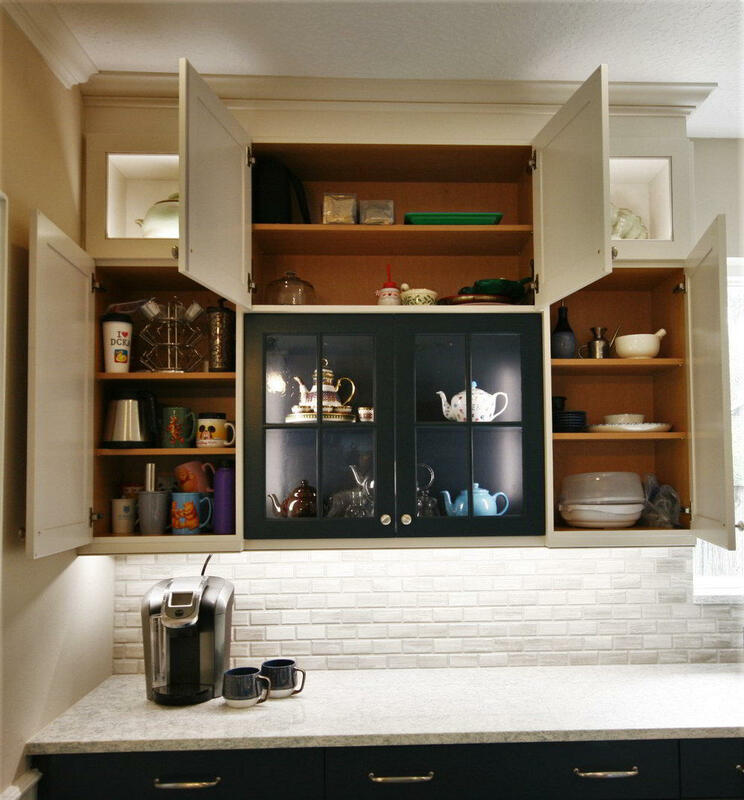 This double-oven range can function as two separate ovens, or a partition can be removed so it can be used as one large oven. 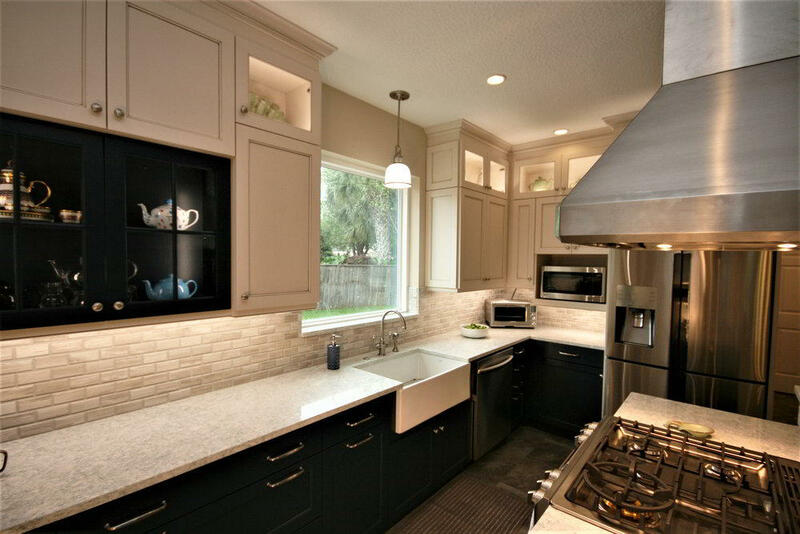 This unique kitchen designed by Scott Haig, CKD of Bay Area Kitchens, features white Brookhaven cabinets by Wood-Mode as a backdrop to rich deep blue accent cabinets and accent tiles. 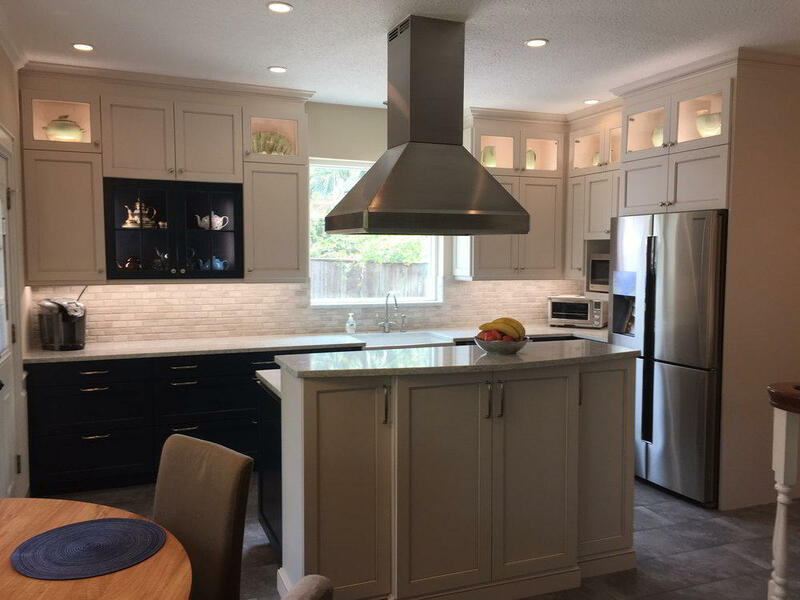 While the Cambria Montgomery countertops appear to be white at first glance, a closer look will reveal a soft combination of blues and grays that pull the whole room together. 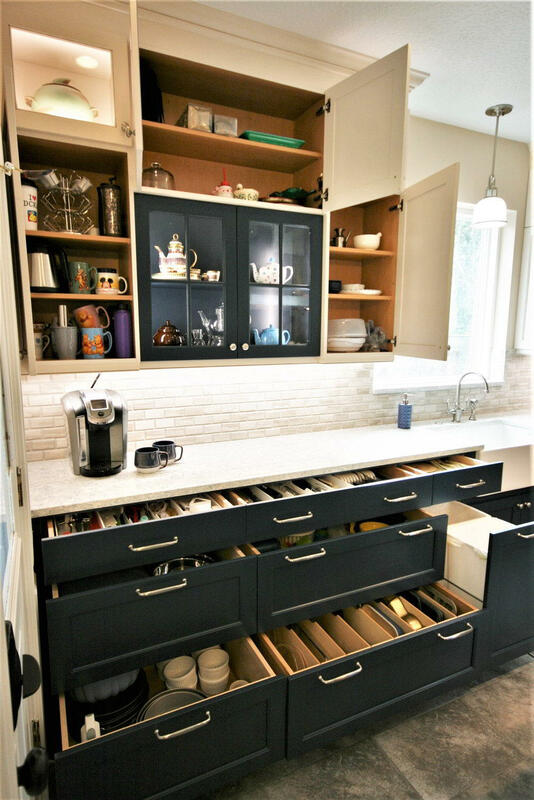 While this kitchen looks gorgeous, it is also packed with functional features and storage, including drawers in most lower cabinets, turn-out shelves to utilize an otherwise dead corner, all adjustable shelves elsewhere, LED lighting inside and below the upper cabinets. 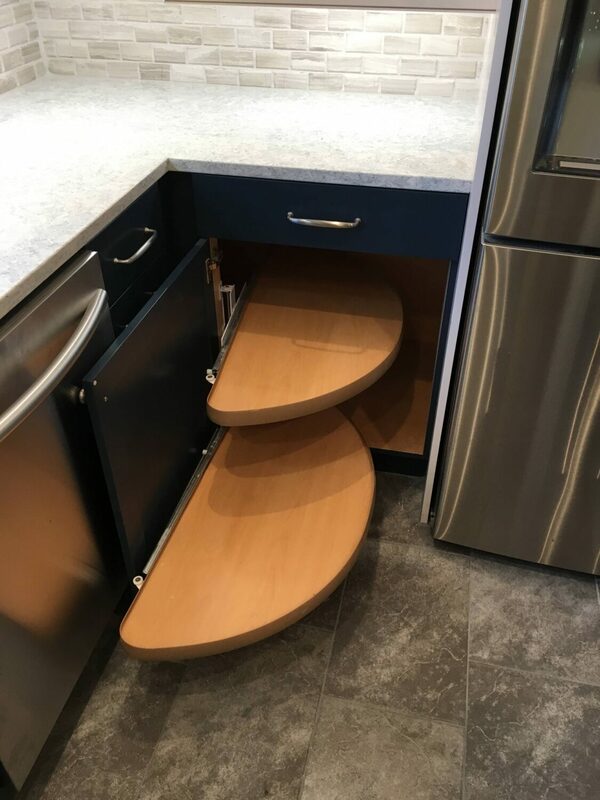 This unique kitchen designed by Scott Haig, CKD of Bay Area Kitchens, features a corner cabinet that has two shelves that turn out and then slide out into the room for easy access to everything on those shelves. 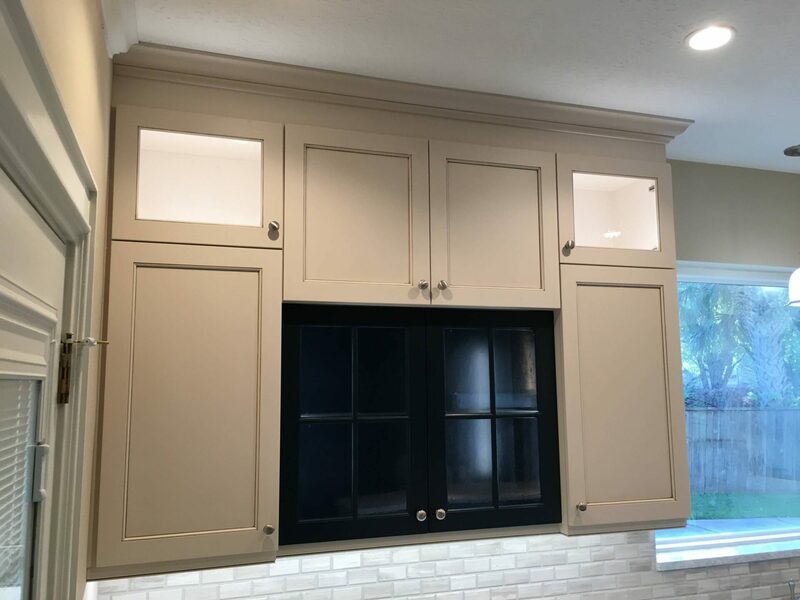 This unique kitchen designed by Scott Haig, CKD of Bay Area Kitchens, features white Brookhaven cabinets by Wood-Mode with LED lighting inside and below the upper cabinets. 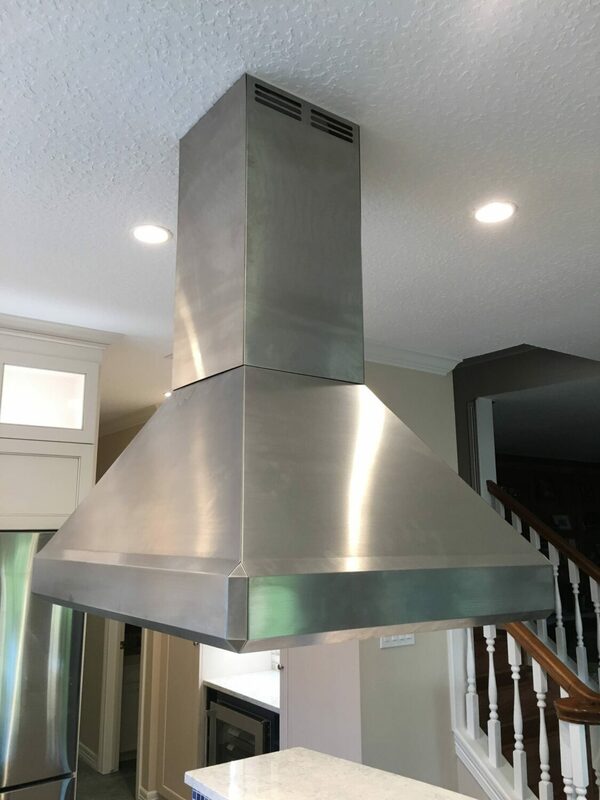 This recirculating hood was custom built for us by Vent-A-Hood. 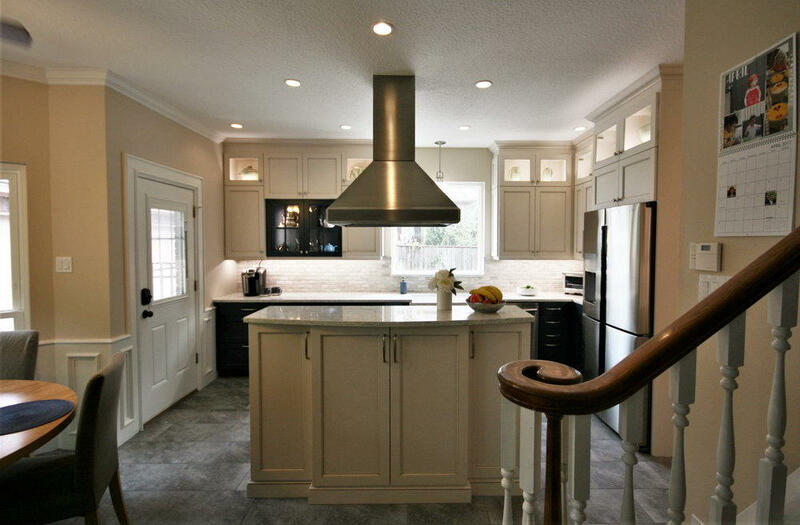 It's the perfect solution where venting to the outside is impossible or impractical. It features a centrifugal blower that extracts the grease before sending the air through five pounds of activated charcoal and then through a HEPA filter before returning it into the room.